Africa is the world’s second largest continent which means that weather conditions vary from one country to the next. Deciding on the perfect time to travel to Africa is often determined by your motivations for going there – where you want to visit, why you’re travelling and of course, your interests! Below is a list of the ideal times to travel to each region in Africa however, keep in mind that all areas can be visited year round. The annual Wildebeest Migration is one of the last natural wonders left on earth and a must see on any East Africa safari. Over two million Wildebeest migrate from Tanzania’s Serengeti National Park to the Maasai Mara National Reserve in Kenya and predicting the movements of the large herds is not an exact science, as it is governed by the rainfall in certain areas. 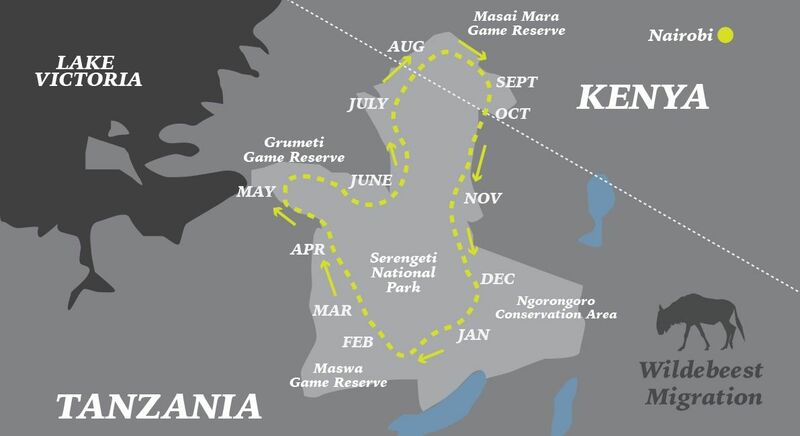 From May to August the long trek towards the Masai Mara in Kenya is in full swing, with some of the herds following the traditional Western Corridor routing, which is where the fabled river crossings occurs at the Grumeti River. The big question of survival comes up at this point… will they survive the river? Others split off to follow a more north easterly direction. From August to November the herds are generally located in the northern reaches of the Serengeti and in the Masai Mara and beyond. The Wildebeest are met with some more opportunities for river crossings on the Mara River, before the long return journey. Eclipse Travel can assist you with all of your flight arrangements including international flights, round-the-world flights as well as internal Africa flights. Which airlines fly to Africa from Australia? If you are departing from the east coast of Australia you have the option of flying direct from Sydney to Johannesburg with Qantas. If you are departing from anywhere else in Australia, you must first fly to Perth then on to Johannesburg with South African Airways. Alternatively, you can fly into Africa by first flying into Asia or the Middle East with airlines such as Emirates and Singapore Airlines. You can fly from most major cities in Asia and the Middle East to most major cities within Africa. Can Africa be incorporated into round-the-world flights? Yes, there are many options, some of which can be good value or if you are simply looking to combine Africa with Asia or the Middle East on the one ticket, there are other good alternatives our team would be more than happy to discuss with you. Baggage allowance often depends on the airline and where you are flying to and from. Generally speaking, international flight allowance is between 20-23kgs, 7-8kgs for hand luggage and 15-23kgs for domestic flights. **Please note, if you are taking a charter flight, or if you are going on an ‘Overland Safari’ or ‘Fly-in Safari’, different baggage allowances may apply and you may be required to carry only a small soft-sided bag with you. Please check with your consultant if this applies to you. Australians need a visa to enter most countries in Africa. The application process varies from country to country and it is often the case that you can apply for them upon arrival into that country. Please see the table below which outlines the visa application process for African countries. Alternatively, the South African High Commission in Canberra can be contacted on 02 6272 7300 or please refer to TIMATIC in the GDS. Madagascar As of 1 May 2018, the tourist visa fee for Madagascar has increased. This is payable on arrival at the airport. The charge for the tourist visa will be EUR$35 per person for arrivals of up to 30 days. Disclaimer – Please note: For official visa advice please visit the South African High Commission or VFS Global visa advisory service. New Zealand passport holders require a visa to enter South Africa. There are South Africa Visa Application Centres in Wellington and Auckland, and applications must be made in person for an interview. Parents can apply on behalf of children under 18. If you are planning on entering any national parks of reserves during your time in Africa you can expect to pay an entrance fee. The amount can vary from park to park and the method of payment can also vary. We recommend carrying some USD with you as this is a commonly accepted form of payment. We highly recommend purchasing comprehensive travel insurance when travelling to Africa. Please check the terms of your policy carefully, particularly with regard to limits of cover and ensure you are familiar with the procedure for making claims. Once you have paid your deposit or full payment, certain fees will apply if you have to cancel your holiday and for this reason you should take out insurance at the time of paying your deposit or full payment, which should then protect you in such a situation. Children from countries where visas are required will no longer have to carry supporting documents. This is because they would have been required to provide these and a copy of a birth certificate during the visa application process. Those from countries where visas are not required may be asked to produce supporting documents upon entry. DoT has said that copies of original documents are sufficient and do not need to be certified. Consent and authorisation can be in the form of a letter. It does not need to be notarised or be an affidavit. Passports – or other identification documents – that contain the details of parents are sufficient. If surnames are different, carrying proof of parental relationship is advised. If children are travelling alone, additional documents are needed. If children are travelling with an adult other than their parents, they would need to carry supporting documents. Parents must produce a certified unabridged birth certificate and a valid passport. Parents must produce a certified unabridged birth certificate, a valid passport and a court order/ death certificate/ affidavit confirming the absent parent has given permission for the child to travel. Guardian must produce a certified unabridged birth certificate, a valid passport and an affidavit confirming the parents have given permission for the child to travel. Child must produce a certified unabridged birth certificate, a valid passport and affidavit confirming permission to travel from both the parents or legal guardians, and letter from person who will receive child in the final destination including their full contact details and a certified copy of their passport or ID. Whilst we understand that no two people are the same therefore, no dietary requirements are the same and these can often be vital to your health. Sometimes due to cultural and language differences, these are not always easy to communicate when you are travelling. Eclipse Travel aims to alleviate these concerns and will assist with communicating any dietary requirements that you may have with our local suppliers in Africa. Please ensure that you inform your sales consultant of your dietary requirements well in advance to ensure the best chance of you getting the foods that you need. We recommend using the local currency for each country throughout Africa as you will get the most value for your money. You will be able to access ATMs in most of the large cities and high end hotels but as soon as you leave the city, ATMs become scarce. As a backup we recommend carrying a supply of US dollar notes and/or the European Euro as these are widely accepted, in fact, many countries charge airport entry fees in US dollars and some national parks will only accept US dollars for their entry fees. If you are on a high end safari, it is quite common to tip using US dollars as well. Travel money cards are also an option for your African holiday as they work the same as a bank card. If you are planning to travel with a credit card then we highly suggest having a Visa card as it is the most widely accepted. Mastercard is accepted in most major cities however, you may have difficulty using it in smaller towns. Diners Club cards and American Express are not widely accepted therefore, we do not suggest relying on these cards. $5-$10 per person for one day or half day guides including city tours, safari walks, rafting guides etc. You are likely to find internet cafes throughout all major centres in Africa and can be cheaper than accessing the internet in your hotel. Not all hotels will offer Wi-Fi, and if they do it can often be quite expensive and it is not always guaranteed to work. If Wi-Fi is included in your hotel, it will be mentioned in your itinerary. When on safari, you may have internet access included in your stay but please note, it is not always reliable. When travelling, it is always best to turn your global roaming off as this can result in a large surprise when you get your next phone bill. We recommend downloading programs such as Skype and Viber before departing to make free calls to your family and friends using the Wi-Fi in your hotel. Alternatively, you can use telephone booths or paid accounts with Skype in internet cafes as a very inexpensive way of making calls and keeping contact. Electrical outlets throughout Africa vary from country to country but will generally be 240 volts. Please visit this link for more information on each country. Suitcase or backpack – most of our tours don’t require a backpack but ask if you are unsure. Thermals, beanie, gloves – during winter temperatures can drop dramatically especially in the early morning and late evening. On both private trips incorporating light aircraft flights and small group overland tours baggage is usually restricted to 15kgs per person, in soft-sided bags only (duffel bags preferred). Hard shell suitcases are not acceptable as they often cannot fit in the luggage compartments of light aircraft planes and safari trucks. These restrictions are designed for your safety and comfort, and it is important they are adhered to. Some light aircraft flights in Botswana allow 20kgs so check with your consultant if you are doing a private safari in Botswana.